Software is eating up the world. And the internet is eating up all software. People are now plugged into their machines all hours of the day. If there is a service out there in the real world, there is an alternative for it in the online world as well. People manage their bank accounts along with their daily meetings with the help of online services. Heck, some people even schedule each and every task they have to do throughout the day in an online calendar. Most of us still use the internet as our primary source of entertainment as well. In other words, the online world is as big as the offline one. And hence, quite appropriately, this age is being called as the digital age. No one can resist the convenience factor that online services offer. They help us manage and control our lives better than we ever could before. Part of the reason why online services are so effective is because they are everywhere. You can access them anywhere and at any time. But all of this comes at a cost. That cost is increased exposure to hackers and cyber criminals. Incidents involving online fraud and stolen private information are becoming more common by the day. In fact, some believe it is the fastest growing business in the world. Hackers of today can leverage modern technology in unforeseen ways. They can hack anyone and anytime and compromise anyone’s private information that is present in cyberspace. But there is another troubling fact most people don’t give enough consideration to. All governments around the world have increased the size and effectiveness of their surveillance programs. And they might have their reasons for doing so. It doesn’t mean you have to give up your privacy. Government departments along with other marketing agencies now have the ability to monitor your every move. In fact, they have the capability to spy on all citizens. The infrastructure for doing so has advanced that quickly. All of this means that more and more people are concerned about their online identity and privacy. The best solution to all of your cyber security problems is a VPN service. A VPN service stands for Virtual Private Network and its main task is to provide you with complete anonymity. You can browse the internet all you want without any fear of losing your private data. A VPN achieves that goal by hiding your real IP address. It can also help you unlock any content anywhere in the world regardless of your physical location. As a result, sites like Netflix and Hulu become available to you even if you’re living in Afghanistan. Because they are easy to set up and even easier to use. It’s a matter of one or two clicks and you’re all set for complete online anonymity. That is one of the reasons why VPN services have prospered all over the world especially in the last couple of years. Now, there are hundreds of VPN service providers out there in the market. IN other words, there are just too many choices. How do you make the right call? It can be difficult, let’s start with that. This guide will help you, in step by step process, how to sign up for the best VPN possible. Today we’re reviewing WorldVPN and how it ranks against some of the best VPN services in the business. When you reach the conclusion section of this guide, you’ll have everything you need to make an informed decision. The first question you should always ask yourself when buying a VPN service, is whether it will work on your device/devices. Modern VPN services offer new users plenty of choices when it comes to protecting multiple devices. And that’s what you should look for. Your aim should be to protect all of your devices, not just one. The good news is that WorldVPN is compatible with most major operating systems. All you need to do is, first sign up for WorldVPN (whether you should is another question) and then download your required version of the software application. You can download the package from the official website. WorldVPN even has an app in the Apple app store for users with iPhone devices. Full marks to WorldVPN for making sure that all users are covered when it comes to VPN client. This category alone warrants a separate article but we’ll try to cover as much as we can quickly. To do that, we’ll have to break it down into small digestible chunks. Because, a VPN’s features is the bread and butter of its potential to succeed. It is a VPN service’s main selling point. We’ll list the important WorldVPN features and then you can decide for yourself if they suit your needs. In fact, you should have a look at other VPN services as well and then compare them with WorldVPN. That would be the ideal case. Does WorldVPN Have Multiple Connections? Modern VPN services must offer this one key feature if they want to survive in this competitive industry. What do multiple connections exactly mean? It means, a feature that allows a user to connect more than one device, at any given time, with one account. Some call it number of simultaneous connections allowed with one VPN account. Most of the users who sign up for a VPN have multiple devices and hence want a VPN service that offers multiple connections. A VPN service provider that is genuinely seeking to attract more customers should offer at least two simultaneous connections for every VPN account. The more the better as they way. As far as WorldVPN is concerned, they offer three simultaneous connections. Three is a good number but not a great one. To combat this problem, WorldVPN offers ten simultaneous connections with their professional package. If you sign up for the free World VPN service then you only get one connection at any given time. The more you pay, the more you’ll get, seems to be the message from WorldVPN. Nevertheless, it’s a positive sign that WorldVPN varies its number of simultaneous connections according to its packages. Most VPN services ignore this feature but if our research is anything to go by, it is an important feature. Needless to say, a money back guarantee feature brings a lot of benefits. People tend to trust VPN services that offer a money back guarantee. If a VPN service says that it will offer a full refund if a new user isn’t satisfied in the allotted time, then that sends out a clear message. IF the service isn’t good enough, you can just leave without incurring any loss. Secondly, it’s also about promises. If a VPN service doesn’t deliver on all the features, new users should be able to back out. WorldVPN has a decent refund policy. Basically, WorldVPN will give you your money back if the service doesn’t work for three days. More specifically though, WorldVPN will give you a full refund if any problems occur within a week of your purchase. There are a couple of points you need to consider before moving on to other feature. The refund policy does not apply to customer service issues. Moreover, if your bandwidth is giving you problems then the WorldVPN refund policy won’t cover it. What About WorldVPN Number of Servers? In short, a VPN service provider must have a large number of VPN servers. More servers mean less pressure on each given server. Less severe pressure mostly translates to greater speeds and reliability for customers. A large number of VPN servers also mean there is more choice for users to route their traffic through. New users also get attracted to more choices in terms of VPN server locations. WorldVPN does a pretty good job in this category as it offers 175+ server locations all over the map. For new users, WorldVPN offers VPN servers in more than twenty countries. Does WorldVPN Have A Referral Program? Why does a referral program matter to new users? Or should it matter to new users? Provided most VPN services do not give much attention to referral programs, it seems like a good place for WorldVPN to steal the march on its rivals. Referral programs, in any online industry, work great. It is one form of marketing that gets results quickly. When a VPN service provider rewards customers for bringing new business it gives out a message of collaboration. Rather than one side making money and the other giving money away. WorldVPN doesn’t really have a referral program. The program WorldVPN has is more of an affiliate program. New users do get benefits from both, though. All WorldVPN users get a unique link which can be embedded in websites/emails. Users can then use these links to promote WorldVPN products. For every new customer that a user brings, he/she gets a 25 percent commission. Overall, WorldVPN has a reasonable affiliate program if you can get someone to sign up for it. The reason why people sign up for a VPN service is because they are concerned about their privacy. They are concerned if their internet service provider and/or the government is logging their online activity. So any reliable VPN service must make sure it scores full points in this category. So before you sign up for any VPN service, you must ensure that the company doesn’t log data. Also, make sure they don’t monitor their users. Otherwise, that defeats the whole purpose of a VPN service. According to official sources, WorldVPN does not keep any activity logs on its customers. This doesn’t mean it leaves its customers alone altogether. WorldVPN does track the IP addresses of its users in order to provide them with technical support. In a nutshell, bandwidth is the exact amount of data a user can transfer from his/her device through the VPN server to its final destination. More bandwidth means, more available data. All premium VPN service providers offer unlimited bandwidth in their paid packages. If a VPN service provider limits the bandwidth even with paid packages then they better have a mighty good reason for doing so. Otherwise, you need to stay away from such kinds of VPN service providers. How does WorldVPN perform here? WorldVPN offers 15GB of bandwidth with its budget subscription plan. If you sign up for their dedicated plan then you get 30GB. Go a bit higher though and you get unlimited bandwidth with WorldVPN Unlimited and Professional subscription plans. Privacy and security should be your main concerns when you sign up for any VPN service. IF you want to make sure that a VPN service is as solid as a rock, then pay attention to these two traits. Now, there are many VPN protocols that VPN companies use with their VPN services. A VPN’s quality though, is judged by the strength of its encryption methods. How does one measure the strength of an encryption method? There are two types of encryptions. One is the 128-bit one and the other is 256-bit one. The 256-bit one is the stronger of the two. As far as WOrldVPN is concerned, it offers OpenVPN protocol for all its subscription plans. For the end-user, this means that they’ll get a military-grade encryption through a 256-bit connection. Users can also opt for the extremely private PPTP VPN protocol but OpenVPN is considered to be the best. On the negative side though, WorldVPN does not offer the ability to change one’s encryption strength. Downgrading your encryption strength has its own benefits. The lower the amount of encryption, the faster is the speed. Each user has to take into consideration his/her own situation before settling for either encrypted or speed. But overall, WorldVPN is pretty much secure. The installation process for any VPN service should be simple and straightforward. With that said, don’t sweat about this part too much. Most people still don’t know how to set up a VPN service even though the process has become really simple. But not everyone is one the same page when it comes to technology. VPN services that want you to go through a computer undergraduate degree to set them up should be shunned. In other words, don’t sign up for VPN services that want you to configure VPN connections manually. There are many VPN services out there that’ll do that automatically for you. WorldVPN is, fortunately, one of those VPN services. All you need to do is to download their client for your operating system and then install it on your device. Then run the software application on your system. You can download the software application package from the official website. And an easy-to-understand installation wizard will guide you through the rest of the process. WorldVPN gets full marks for a click and connect VPN service. All VPN service provider should pay attention to the user interface. After an easy installation process, it is a must to back that up with an intuitive user interface. Using a VPN service should be as simple as clicking on the desired server and then connecting. VPN services that require you to learn about other configuration settings are asking a huge favor from you. WorldVPN is reasonably easy and intuitive to use. Users can simply run the program, go to the main menu, log in and then pick their favorite server. After that pick the preferred VPN protocol and then click connect. For a simple user interface, WorldVPN gets the green light. How To Log in To WorldVPN? If there is one fault in WorldVPN software, it is this. WorldVPN provides users with a Remember Me option and the dashboard is sufficiently populated, there is no way to confirm your username and password. As a result, you’re always guessing if you have connected to a VPN server. You only know when you actually connect to the server. This is, at the very least, annoying. How To Change Servers In WorldVPN App? As indicated earlier in the article as well, changing a VPN server is pretty easy in the WorldVPN app. Let’s say you want to change your VPN server to Singapore. All you need to do is disconnect from your current server and then select the new one. When that’s done, simply hit connect to have a secured VPN connection from Singapore. Any online service that wants to not only stay alive but also thrive must have a good customer support system. That holds true for VPN services as well. VPN services are online-only services and hence rely heavily on customer support. To put it another way, VPN services must have excellent customer support. If a VPN service has an unresponsive customer support, it is pretty much dead. Because of the competitive nature of the VPN market. Hence, when you look at a VPN service, always check the customer support department by ringing in once or twice. In the modern web, this is a must. No other form of customer support can replace the 24/7 helpline. Customers want to get in touch with their VPN service quickly. And for that, a VPN service must have 24/7 customer support line. If a VPN service takes more than 24 hours to respond to any query, then that’s bad news. Bad news for the VPN service, not for the customer. WorldVPN doesn’t have too much information on the matter on its official website. But, some reviews have shown that WorldVPN doesn’t have 24/7 customer support. Which is a big let down. In other words, you’re going to have to wait for a while before WorldVPN representatives get back to you with your answers on any query. Multiple customer support options is always a bonus. As a matter of fact, all best VPN service providers offer multiple ways for potential customers to get in touch with them. One of those ways is email support. With an email, you can conveniently get your message across at any time of the day. It’s obviously not an instant solution. Other options such as live chat and phone support offer quicker responses, but not all VPN service providers can afford them. WorldVPN offers new users email contact as well as live chat. But the live chat feature is only available via the official website which is an industry standard so no complaints there. Just because a VPN service provider offers many options, doesn’t mean all those options actually work. With WorldVPN, don’t expect a quick response, let alone an instantaneous one. Various reviewers have reported that WorldVPN website support team is never online. So this definitely hurts WorldVPN final review score in our opinion. Before we get to WorldVPN, let’s first understand how should one measure a VPN’s speed. Essentially you turn on the VPN connection and then go a website like Speedtest.net to test the speed. And then compare that speed with your normal internet connections’ speed. All VPN’s will drop your standard internet connection’s speed. That’s just the way VPNs are built. We would happily answer this question for WorldVPN. Except for the fact that it is irritatingly hard to connect to one of its servers. WorldVPN customer support isn’t great and hence they are not going to solve any of your problems quick enough. But generally speaking, a good VPN service will allow you to visit media heavy websites without much trouble and perform well on streaming sites as well. As we indicated earlier as well, WorldVPN app sometimes gives you login errors. And that doesn’t help when one is trying to review a VPN’s speed. WorldVPN features won’t do it any good if customers can’t even log into the service. Needless to say, WorldVPN’s ranking goes down the drain with users not being able to connect to the service at all times. What good is a VPN service if you can’t afford it. Or don’t think the company’s services warrant the prices they charge. Many VPN services offer great features along with great speed. But charge their users so much that they are not able to climb up the VPN rankings. In short, users should not be forced to break the bank in order to sign up for a VPN service. 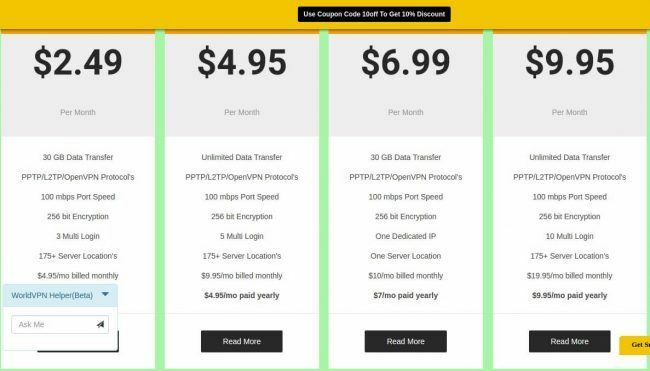 As we have mentioned time and time again in our reviews, you should not pay more than $15 for a given VPN service per month. Any more, and they are overcharging you no matter the quality of their service. WorldVPN packages come at a reasonable price. IN other words, they are pretty much affordable starting at $2.49 for the budget plan and $9.95 for their business plan. WorldVPN offers four types of packages. To further confuse you, WorldVPN has different features for each of its packages. You can refer to the screenshot below to have a look at them yourself. As you can see, WorldVPN offers different simultaneous connections and bandwidths for different packages. Even the number of servers are different for different packages. And that is also the reason why WorldVPN loses points for not keeping their packages simple to understand and subscribe to. One Special Thing About WorldVPN. There is one quality about a VPN service that defines it. Think of it more like a deal-maker or deal-breaker quality. As we have mentioned earlier in this review, the VPN business that is run completely online. And therefore, VPN companies have to make a good impression with the customers on the first contact. That first contact is the official website. A VPN service has to make customers feel secure and comfortable while purchasing the product. These can ruin any online business let alone a VPN service. Sadly, WorldVPN has all of these qualities. The person who wrote the content on WorldVPN website clearly did not understand the English language that well or was not a native speaker. In other words, the content in unclear and not very informative. The information presented on the official WorldVPN site is disorganized and hence not of much use to any visitor. If you were looking for any hint of professionalism then you won’t find that on the WorldVPN official website. All of this makes it really hard for potential buyers to invest in a service that doesn’t give off a neat vibe. It’s a no brainer actually. We’ve already listed out the things you need to watch out for when buying a VPN service. And while WorldVPN has some interesting features to its name, it has some major drawbacks. Hence, we cannot recommend WorldVPN as your primary VPN service provider. Most of the features offered of WorldVPN require the user to pay extra money in the form of more expensive packages. The refund policy isn’t all that great and might scare away new users. Anything good that WorldVPN has to offer to new users comes at increased price. And while it has some good points, all of them are offset by its negatives. From the many drawbacks, an ugly official website should be the first one WorldVPN should work on.